Item2013.6.36.1.002.001 - Home in Nanaimo, B.C. Item2013.6.36.1.002.003 - Provincial Government Mine Rescue Station in Nanaimo, B.C. Item2013.6.36.1.002.004 - Home in Nanaimo, B.C. Item2013.6.36.1.002.005 - The Canadian Bank of Commerce in Ladysmith, B.C. Item2013.6.36.1.002.006 - Office of the Central Coal Co. Ltd in Nanaimo, B.C. Item2013.6.36.1.002.008 - Brick home in Nanaimo, B.C. Item 2013.6.36.1.002.005 - The Canadian Bank of Commerce in Ladysmith, B.C. The Canadian Bank of Commerce in Ladysmith, B.C. 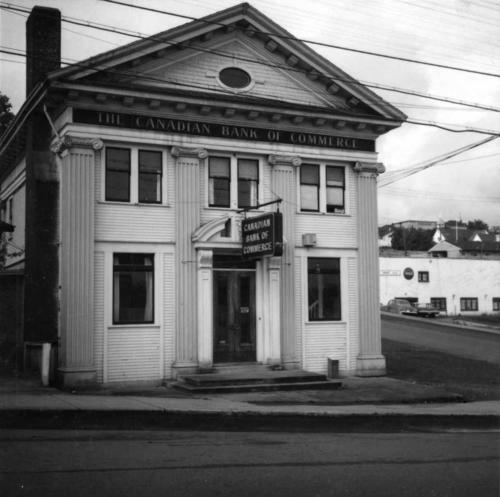 Photograph depicts the Canadian Bank of Commerce in Ladysmith, B.C. on Vancouver Island. Building is estimated to be built between 1901-1905.